Watermelon is the fruit of the earth with thick green skin bursting with luscious red fruit inside and black seeds. It comes packed with tons of water, antioxidants, vitamins A and C and nutrients. 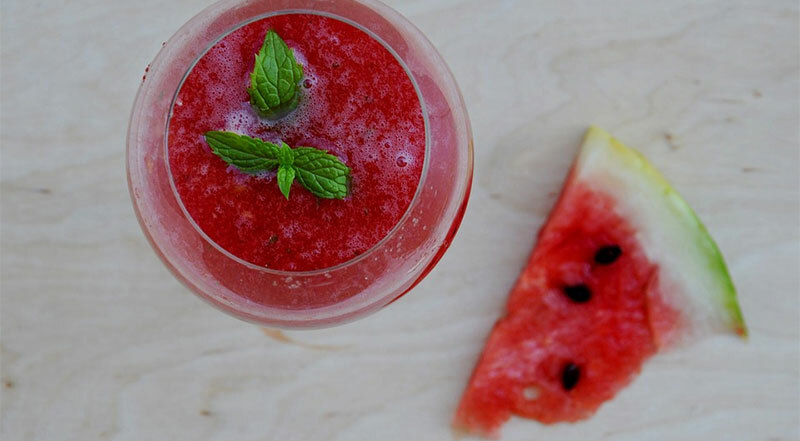 Watermelon juice is an refreshing snack for warm summer days although it isn’t strictly reserved for that purpose and can be easily added to your diet year round for a quick health boost. Start by washing and cutting your watermelon into several pieces, carefully remove the black seeds (smaller white seeds can be retained and juiced). Remove the fruit pulp from the rind and add to a blender or juicer. Alternatively retain the rind but clean it thoroughly with vinegar and slicing it as thinly as possible before juicing. The rind holds a lot of vitamins and nutrients you’ll lose by throwing it away, just make sure your juicer or blender can handle the extra work. Ice is optional then blend/juice till smooth and easily drinkable. The first big benefit to watermelon juice is hydration, water is a basic human need. Watermelons contain over 90% water which means they’re super hydrating. It’s recommended that the average adult drink approximately 8 glasses of water a day directly or indirectly through food and watermelon juice can help you towards that target. Another cool pro to drinking watermelon juice is weight loss. It’s composed mostly of water so therefore hardly any calories and fat content. Two quick ways to lose weight with watermelon juice is substituting it for sugary drinks like cola and not adding sugar at the juicing stage. Swapping out calorie heavy sodas like this will help lower your calorie intake throughout the day. Not only that but watermelon juice is beneficial for your cleansing your kidney and bladder. As mentioned above you can retain the smaller white seeds during the juicing process and in this instance they are known for benefiting the kidney. When minerals and acid begin building up in your body kidney stones become a massive problem, this intensifies when you’re not drinking enough water to flush both mineral and acid out of your system and uric acid starts to build. Watermelons help as they contain massive amounts of water to prevent the initial buildup, flush out kidney stones and regulate urine flow. As if the potential cancer-preventing benefit isn’t awesome enough, you can also potentially improve your cardiovascular health with watermelon juice. (source) This is because watermelon is packed with something called citrulline, which is an amino acid that is converted to arginine by the body. And, arginine relaxes your blood vessels and improves blood flow in the body. The best way to take advantage of the benefits mentioned in this article is drinking a glass each morning as part of a healthy diet!